Reclaiming Phantoms in Kamal Aljafari’s "Recollection"
Kamal Aljafari remembers when Jaffa was transformed into civil war-torn Beirut. Under the direction of Menachem Golan, the production team of The Delta Force (1986) created urban mayhem, arranging for the explosion of real buildings in the staging of a fictional battle. Aljafari recalls standing on the side of the road with a group of other children, eagerly awaiting a glimpse of Chuck Norris racing by in a van with the name of their school, “St. Joseph,” printed on the door. Years later, while flipping through television channels in a hotel room in London, Aljafari was shocked to recognize this scene. He sat on the bed mesmerized, not by the action shots but by the background: a clear documentation of the Jaffa of his childhood, a city which has since been destroyed, renovated, gentrified and rebuilt beyond recognition. Aljafari was born in neighboring Ramle in 1972 and later emigrated to Germany to attend film school. His previous films include The Roof (2006), which follows him on a return visit to the homes of his parents and grandmother in Palestine, and Port of Memory (2009), which traces the eviction of his mother’s family from their home in Ajami. Aljafari’s dark humor and silent communication style liken his work to that of Palestinian filmmakers Elia Sulieman and Michel Khleifi. Aljafari describes the editing process as an obsessive, almost magical project of compiling a picture album, of re-making his memories through a found archive. It was a sort of forensics - the meticulous reconstruction of an environment that no longer exists. 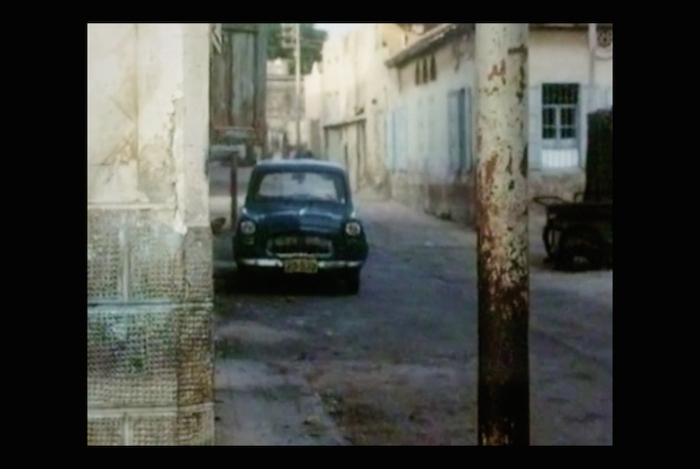 He often had to complete parts of buildings or roads that had been blocked out by the actors he removed, those he calls “cinematic occupiers.” In some cases, Aljafari has drastically altered the scene, in one case digitally repainting an interior wall from brown to blue according to his memory of these homes. At other times, he allows the Israeli actors to stay because editing them out completely would have been too difficult. 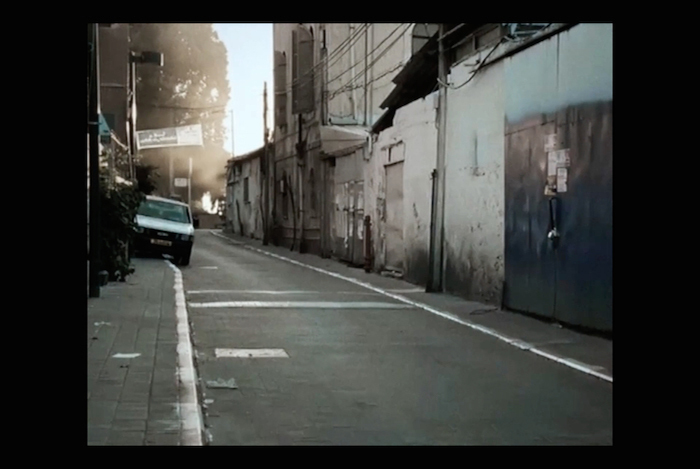 One scene shows former actor Uri Zohar beating an effigy in a black and white alleyway. 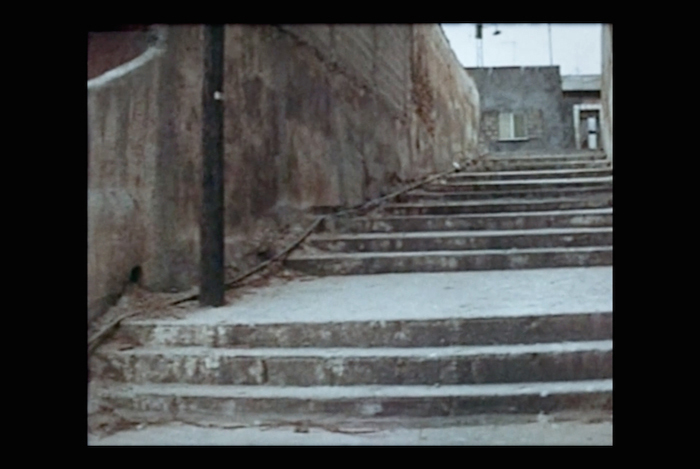 In another, Israeli singer Ofra Haza walks down a stairwell in footage from West Side Girl (1979). Instead of erasing her, Aljafari intervenes by flipping the scene upside down. The film contains no narrative structure, instead taking the form of a repetitive and rhythmic poem. Time slows down as the camera lingers lovingly over the textures of a wall, a single tile on the ground, and a detail on a stone windowsill that resembles a human nose. At other points, the camera goes berserk, rapidly scanning the frothing waves of the sea or racing down an empty highway. Viewers witness the construction of massive high-rise apartments and the chaotic production line of an orange factory - moments in which the dreamer enters a nightmare. However, despite the rich poetic nature of each dream sequence, the significance of Aljafari’s methods and theoretical logic may be lost on a viewer who is unfamiliar with his intentions. The concept of the film is best understood (and enjoyed) when the filmmaker himself is present. In one sense, the title of the film refers to the act of remembering itself, an act that is fragmented, blurry, and repetitious. It is the act of spending time with a thought, which is exactly what Aljafari’s camera does. It sits and stares, contemplating the sound of the waves or the texture of a single archway. In another sense, recollection is an act of collecting again and again. Aljafari is gathering and reclaiming the very real phantoms that haunt other people’s fictional narratives. He recounts that one night while he was watching a boureka film he noticed his uncle strolling around in the background, presenting him with the only moving image he has of his now-deceased relative. The camera returns to this shot again and again as the dreamer experiences a flashback. As a child I liked to lean against it. with his small transistor radio in summer afternoons. Aljafari explains that the taxi driver Farraj was married to Margo, a Kurdish Jew from Iraq. They had two children, a son living in Tel Aviv and a daughter living in Jaffa. He identifies the home with the cement stairs as belonging to his mother and lists off the names of her neighbors: Sasien, Rantisi, Qubti, Ramam, El Ashwar. In this way, the film bears witness to the past through a project of shared ethnography, an experiment in which visual data is reproductive of oral histories. 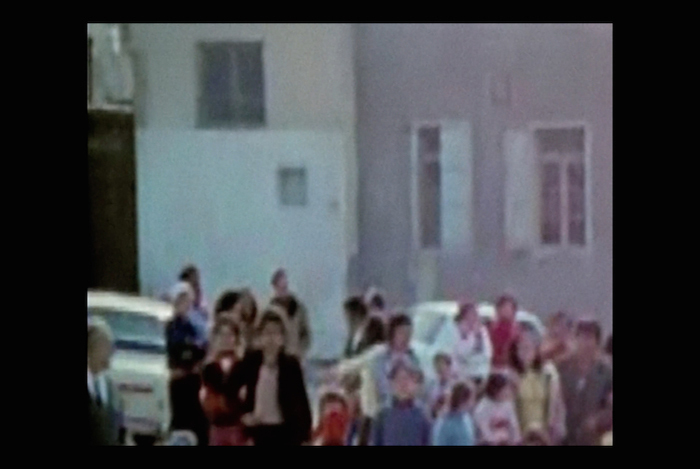 Through the sharing of found footage, Aljafari collects names, anecdotes, and testimony. The virtual museumization of the city in time and space raises questions about the potential of cinema not only for historical documentation but also for legal purposes, such as in indigenous claims to territorial jurisdiction. Yet the character’s movement possesses an uncanny echo of other real and imagined pasts. In Zionist mythology, for example, the parentless Sabra emerges spontaneously from nature, as in Moshe Shamir’s 1970 novel With His Own Hands, which introduces the protagonist Elik as being born from the sea. The sequencing of images proceeding from sea to land also recapitulates the perspective of Europeans who arrived in the East from the sea, from the West. 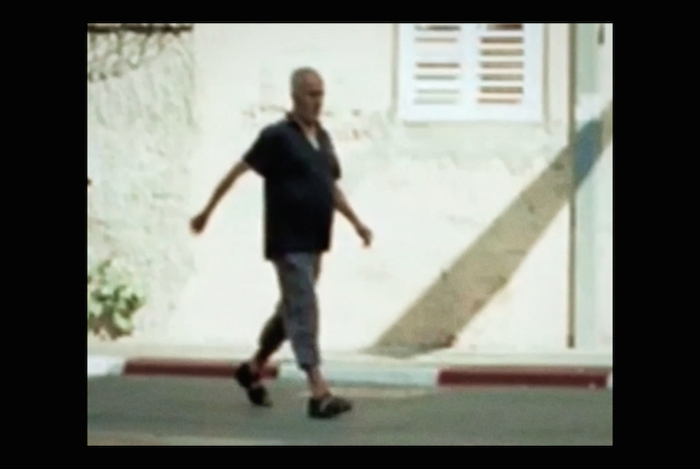 As film theorist Ella Shohat explains, this journey happened “geographically (Mediterranean), metaphorically (identifying with Europe), and even linguistically (since yam in Hebrew signifies both sea and west).”2 By tracing these same routes, Aljafari’s dreamer reclaims the mythological movement as his own. The crumbling buildings and alleyways that these characters inhabit conjure Walter Benjamin’s thesis on ruins as spaces in which the destructive nature of progress is embodied. The imagery invokes contemporary Aleppo or 1945 Berlin, cities which have been bombed beyond recognition. Yet in Recollection, Jaffa is not merely an objective screen onto which history is projected, but rather a constellation composed of multiple interconnections between past and present, visibility and invisibility. The Jaffa of today has been transformed into a profitable seaside resort for bourgeois Israelis, accelerating the internal displacement of Palestinians that began in 1948. Aljafari has drawn upon cinema as a means of intervention, harnessing its ability to rewind, freeze, re-watch and resuscitate his beloved city, giving destruction a new sense of reversibility. 1. Michael Landmann, “Talking with Ernst Bloch: Korcula, 1968,” Telos 2 (Fall 1975), p. 178. 2. 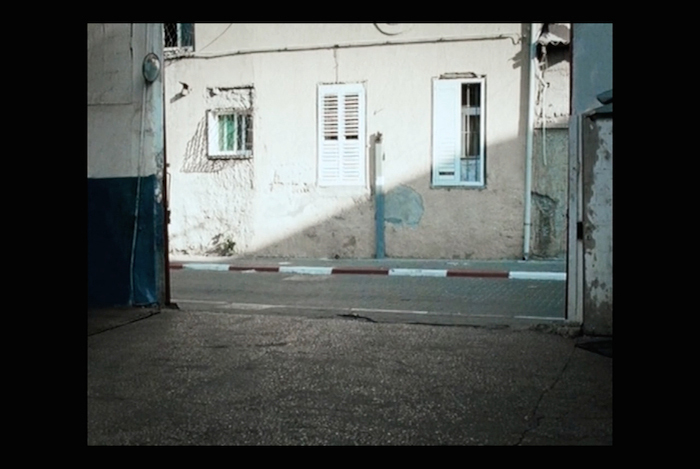 Ella Shohat, Israeli Cinema: East/West and the Politics of Representation. Austin: University of Texas Press, 1989, 37. Shimrit Lee is a PhD candidate in Middle Eastern and Islamic Studies at New York University. Her research concentrates on visual cultures of Israeli militarism with a focus on how modern warfare is imagined, exhibited and commodified in virtual spaces such as international arms exhibitions, cyber and mock urban training grounds, videogames and war apps.